Omg, lol, how long do you keep these things for? Recycle every year not more than two. They are workout clothes afterall. This is funny and gross. @ anon 3:31 pm - Lol, what? It happens to be one of the most comfortable lululemon tops I own and one I only wear in summer for around the house. If you follow my Instagram you'll see a lot of my lulu gets worn a few times a year so it lasts a long, long time. I do get rid of the stuff I never wear and prints/colors I get tired of but I have a couple dozen vintage pieces I don't plan on getting rid of anytime soon since they're comfy and timeless - examples: relaxed fit shorts, Remix Light hoodie. 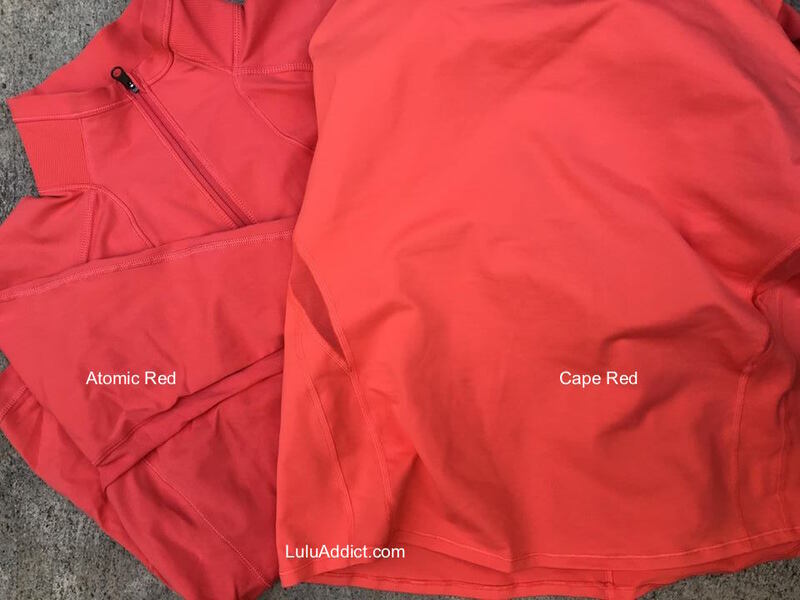 Thanks LuluAddict for painstakingly taking the time to do the color comparisons of all these beautiful orange-red tones. I always love your color comparisons. How you keep the color names straight & remember which colors are your Lulu pieces is so amazing! and are very durable despite repeated wear & washings. Thanks again for all your helpful postings (color comparisons, try-on & store reports). So appreciated! I think the person on the first comment just happened to stumble upon your website, LuluAddict. Definitely not aware of your Lulu collection. Anon 3:31 get a grip. Some of us take good care of our clothes and have enough in rotation and aren't so worried about what anonymous busy bodies think that we're willing to get rid of perfectly good clothes because some judgmental loser thinks we should. Do you not wash your clothes? You must not, since you seem to think clothes have an expiration date. You're probably one of those people loading up the landfill with "fast fashion." I'm befuddled by anon 3:31 pm's comment. Workout clothes get washed. Why would they be "gross" after 1-2 years of normal wash and wear such that they need to be recycled????? Who is recycling their Lulu every year?? There's no reason to do this. Do you also throw out your underwear every month? FYI, you can wash clothes. There's a machine for that. @anon 3:31, that's the most ridiculous statement I've ever read. The world is drowning in discarded clothing. People should stop thinking of their clothing as disposable, get used to wearing the hell out of their stuff, and expect manufacturers to produce items of quality that last for a long time. Workout gear should especially be held to a high standard of quality, functionality, and durability, and keeping it for a long time should be the default. You are what's wrong with the world. Ha Anon 3:31 that's ridiculous! How is that funny and gross? Why would you throw out perfectly good clothes that you really like? @3:31 I have so much LLL stuff that there are things I get to wear maybe three times or less a year. At this rate, they will never be worn out and some of my favourite pieces are 10 years old, yet they look brand new. Why would I get rid of them after a year or two, especially if the styling is timeless? Like Lulumum, I do sell what I never get to wear, but that's only a handful over like five years. I very carefully curate my work out collection, so I don't feel the urge to get rid of my clothes. I agree with LLA. I don't think it's funny or gross that she has things from several years ago. 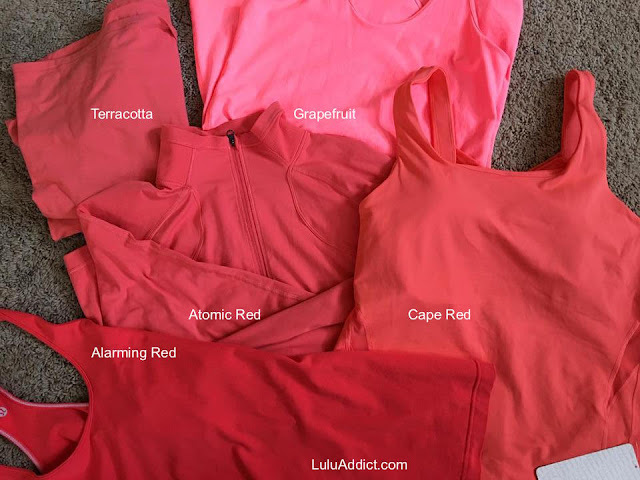 I also have a large lulu collection; like her, I rotate through my workout wardrobe and wash things carefully so my gear lasts an incredibly long time as well. Some of my favorite lulu pieces are the oldest ones. anon 3:31, I am perplexed by your comment????? why is it gross???? don't know why someone keeping their clothes more than a year or two is gross????? Perhaps you havn't heard of washing your clothes and you don't? I guess it takes all kinds if this is the case you should wash workout wear w/ alot of soap after every wear. Work out clothes are an investment and if you take care of them they last YEARS AND YEARS AND YEARS...... And I bet you are not a nice person and not too bright! Please post this comment lla. @anon 3:31 not everyone can afford to recycle lululemon clothes every year or two. One of the reasons I buy lululemon clothes is because they last so long. Also my older pieces are much nicer, better made, and have better quality fabrics than anything they've put out in the last several years. I wouldn't call keeping workout clothes for that long gross. What's gross is to not wash your workout clothes. I always thought my alarming CRB is really orange but it looks like a true red next to all the oranges! Are you serious anon 3:31?! There's this amazing invention called a washing machine which means I keep most of my clothes waaaay more than a year or two. You should definitely try it out. @ anon 10:36 am - Good point. I read an interesting article that said back in the 60s people spent a lot more 10% of their income on clothing but only bought about 25 items a year and now we only spent 3.5% of our income on over 70 pieces of clothing a year. @ anon 9:19 pm - I have a spreadsheet with the style and color names (sometimes the codes) and I keep the hang tags. The hots pinks are the toughest to keep track of and I've had to resort to marking down the color of the stitching on the inside of CRBs to be able to be able to tell one from the other. I have pizzaz which is a true bright orange so cape red is a red orange color..... I love it! I think I will have to get the crb for sure. Anon 10:36 AM, I totally agree with what you wrote! I've been watching a ton of documentaries lately and recently watched an excellent one on Netflix called "The True Cost". For anyone who hasn't already seen it, I'd definitely recommend this one, especially for those of us Lulu/shopping addicts! Also loved the documentary called "I Am", as well, for anyone interested in watching these kinds of things. Should in case you ladies have forgotton, Lululemon is an activewear/yogawear brand. Nine years of continous wear or occassional wear of especially workout clothes is excessive. Wash it with bottled soft water, filtered water, have your butler wash it, have a specialist wash it...at the end of the day, it is still gross after a long time. Stop kidding yourselves. It is not about who is rich or not...it is just reality! Stop taking things personally! The statements form Anon at 10:30 and 3:31 seems so bizarre. Why would someone consider a cleaned item "gross"? If it was totally stained, snagged, torn, stinky, full of holes, etc., OK I might consider that gross. As you said, it is not a matter of being "rich or not." It's a matter of common sense and intelligence. In any case, why should anyone care how chronologically old some item of clothing may be? And why would you make nasty, judgmental comments? Seriously bizarre and offensive. I don't think people are taking it personally --- if one wears an item 3 times a year -- for 7 years - that equates to 21 times - hardly worn...I have basic high-end business pants, jackets - and have had them for several years -- they are classic pieces, why would I throw them out to replace with similar item....not everyone wears their clothes daily (as my math example shows - 21 times worn - for an hour is hardly abuse) LOL You are entitled to your opinion, but understand the facts...washing an item 21 times hardly wears it out especially when it is done on delicate cycle and hung to dry (driers kill athletic wear). I am envious of some LLL lovers who have classic pieces in a print that won't be duplicated again---I too would hold onto it. And if you are paying $100 for tights, would you not expect them to last for a few years (again, do the match 21 wears of an hour each is hardly excessive --- for $100 they should last longer - and that is why some choose to spend that much on an item). Now that's my opinion - with some facts thrown in -- when you state it is gross and funny, that is mean spirited......so maybe now that you understand why pieces can last so long, you will be a little wiser. I have love red which is basically a vermillion red color. the idea of replacing clothes of any kind is very new, and it's pushed by the whole fast fashion thing which is a real problem and cause all the abuse (sweatshops) and not to mention waste, lots of waste. I still have lulu items that I bought in 2009 and are still in great condition. I, like LLA take care of my stuff (not just clothing) shopping for new stuff every year is gross and devastating to the environment. 3:31 please educate yourself. I saw 25 comments and thought that's a lot of comments for a colour comparison so I thought I would check it out and now I see why. Anon 10:39pm if you think that the other posts are taking it too personally, well then you just did what you are accusing the others of doing. To each their own on how long anyone chooses to keep their activewear before deciding not to wear it anymore. How you pick your words in describing your difference of opinion is important and LOL and gross IMO was not necessary or nice. I have activewear that's 5 plus years that I still wear ocassionally that's in great condition that I still love and plan to keep for many more years. The fact that lulu fans tend to have a lot of lulu in their closet means most items don't get worn a lot meaning they remain in great condition for a long time. Thanks LLA for taking the time to show us the colour comparisons, it's very helpful and interesting. Duly noted, Anonymous 10:39 PM. Now let us have an enjoyable conversation. It's funny that this conversation popped up.... I just read an article in Bloomberg Businessweek about a guy that designed a 30 year sweatshirt. This is because the fashion industry is the second most polluting industry after oil. I'm with LLA, I buy quality pieces and take good care of them, and they last me a long time. I have a gazillion pieces of lulu. I could wear a different outfit the rest of my life and probably not have to throw any out. Honestly, I could care less what others think of how long I keep my lulu or how frequently I wear it. @ M 11:59am: If getting new clothes every year is gross and devastating to the environment, what does getting new clothes every week do to the environment? Educate us oh ye wise one! Agree with everyone who keeps and looks after quality pieces. Having said that tho I find it really hard to buy anything worth keeping recently!! !